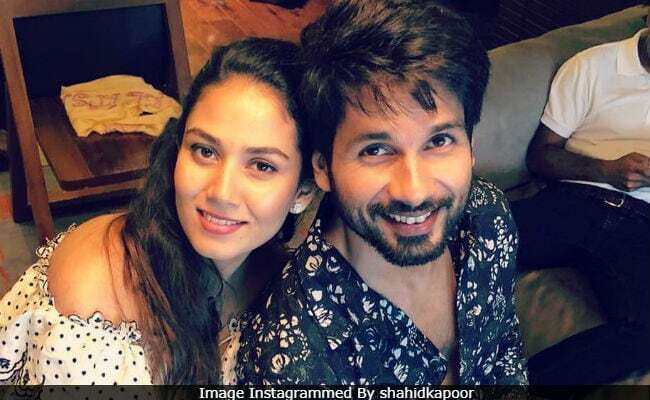 A baby shower for Shahid Kapoor's wife Mira Rajput was hosted on Sunday afternoon at the couple's Mumbai home. Shahid and Mira, who are parents to a daughter named Misha, are expecting their second child. For the baby shower, mom-to-be Mira glowed in a white and black polka dotted outfit, which she simply paired with sparkling studs. Shahid complemented her in a black-printed shirt and blue denim. Inside pictures from the baby shower have been shared by several fan clubs on Instagram, where we can see Shahid and Mira cutting a cake and interacting with the guests. Shahid also treated his Instafam to a picture with Mira. Filmmaker Abhishek Kapoor's wife Pragya, who is also pregnant with their second child, also attended Mira's baby shower. She posted a picture of Mira surrounded by her friends. Inside Mira Rajput's baby shower: Sugar, spice and everything nice. (So cool, Shahid and Mira). Chef Shilarna Vaze, best-known for her role in Esha Deol's Na Tum Jaano Na Hum, shared a picture of her daughter with Mira and wrote, "From birthday brunches to Misha's first birthday to baby showers for the new, it's been so lovely to cook for you! Blessings all the way for baby number 2." Shahid's brother Ishaan Khatter also attended Mira's baby shower. He was accompanied by Janhvi Kapoor, his Dhadak co-star. Janhvi opted for a floral outfit for the ceremony. Shahid Kapoor and Mira Rajput married in July 2015. Their daughter Misha will turn two this August. The 37-year-old actor had announced Mira's second pregnancy with a picture of 'big sister' Misha. Last seen in "Padmaavat", Shahid Kapoor will now begin training for Arjun Reddy remake. Batti Gul Meter Chalu, which he wrapped recently, is his next release.